This article has been edited 9/28/2011 to reflect changes in availability of the book. While on vacation, Rob discovers an alien space ship that had been entombed in a mountain cavern for centuries. They exit the cavern together and their future becomes inexorably intertwined, both mentally and spiritually. The ship, named Solomon, and Rob discover time travel with the help of an alien woman, Torena. Rob becomes obsessed with returning to his boyhood days as Torena becomes his mentor in his quest. The Wisdom of Solomon is a compelling story of how we influence each other as we speed down the rocky roads of life. Many decisions will affect the future, but some may even affect the past! Let me start by saying that I never ever will tell you that you shouldn’t read a book or see a movie. I will tell you if I liked the story or not and then I’ll explain why. You, as a grown adult (or young person) are smart enough to make your own decisions based on what I’ve written here. 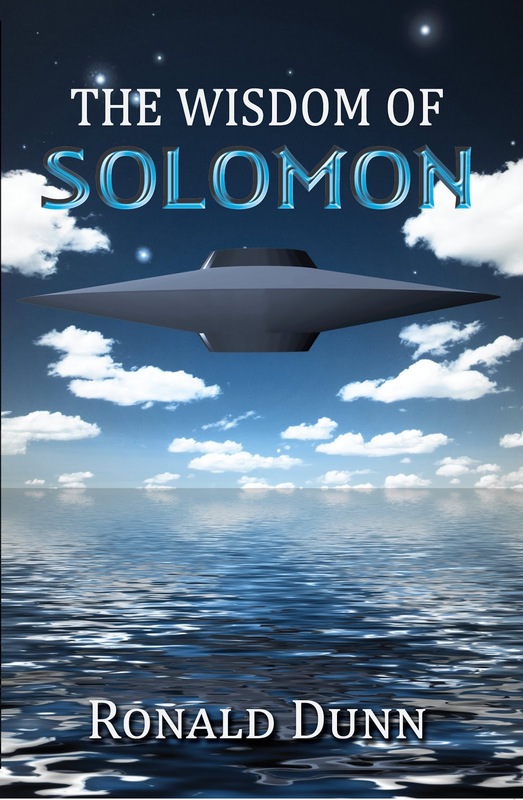 I read the back cover of The Wisdom of Solomon and thought to myself that it sounded vaguely reminiscent of Stephen Coonts’ novels Saucer (affiliate link) and Saucer: The Conquest (affiliate link). Typical “Hey, we found a saucer. What do we do now?” fare, but upon getting into the first couple of pages, I soon realized this would be anything but that. Having not read anything from the first perspective in some time, I was a little thrown off at first, but I soon settled in and started to question what was happening and wondering what the characters would do next. The synopsis at the top of the page pretty much says it all, so I won’t go into too much detail for fear of giving something away, but let it be known that a sequel to The Wisdom of Solomon is required and I, as well as his fans, have let Ronald know that. The book is a very enjoyable read and one that didn’t take me very long to get through, which is really saying something when I’m juggling a child, a job, a sick wife, and a other duties. This is considered Christian fiction and I know that some readers turn their noses up at it, thinking that it will just be preachy and heavy-handed in verses, but let me stop you there and just say that it is a well-told story and to give it a chance. You won’t find any colorful language, in fact, he tells me how his wife questioned him on the use of the word “damn”. This is a story of whether, to borrow from another story, the tin man can get a heart. Not a lot on showy space battles, but plenty of “what if” makes this a thought-provoking read. I think what makes me enjoy the book even more is the story behind it. Ronald Dunn admitted that he wrote the book as a task on his bucket list. Being a fan of the TV show Star Trek, it was an idea that he had been bouncing around for years. Finally, he decided to do it and after a little over three years of working in secret at his office, he handed a copy to his wife for Christmas. He kept it secret from her the entire time! In parting, I like the book. It’s simple story-telling that leaves you with questions to mull over. Nothing jumps out as a disappointment, so I don’t think you would be at a loss to check out this book. Ronald Dunn will be signing copies of his book on May 7th at 2 p.m. at the Barnes & Noble of Highland Village. Here’s the link. You can contact Ronald Dunn at his website, his Facebook page, or The Wisdom of Solomon Facebook page. The book is available through the author's website, Amazon.com and in eBook format through several websites.